Since 1937, January has been the chosen month for every president to deliver his inaugural address to the American people. It seems like just yesterday that we listened to 47-year-old Barack Obama deliver his first inaugural address in January 2009. The moment was significant for several reasons: he was the first black person elected to the Oval Office, the second president to take an oath of office with his hand laid on Abraham Lincoln’s Bible (Lincoln himself being the first) and only the third president to enter the White House directly from the U.S. Senate (Warren Harding and John F. Kennedy being the others). Acting on his declaration, Obama’s eight-year effort to reverse the tide of failure in American schools included some important victories. They include the passage of the Every Student Succeeds Act of 2015, reining in unscrupulous for-profit higher education institutions, and executive action to address the school-to-prison pipeline for youth and the prison-to-work pipeline for adults. At the same time, the administration fell short of its goals. Shrinking the number of “dropout factories” from 2,000 to 800 between 2010 and 2016 is an impressive accomplishment, but Obama had hoped for more. At the higher education level, while some of his policies helped many first-generation students attend college, a change in the Parent Plus Loan program in 2011 negatively impacted thousands of students from lower-income households. This decision particularly affected those who wanted to attend historically black colleges and universities — a core constituency of the Obama administration. Every president leaves the White House with clear victories and shortcomings in education. How should we assess the Obama legacy? While the Common Core, “Dear Colleague” letters spelling out Department of Education guidelines, and gainful employment statistics are the usual suspects for assessment, these items paint an important but tiny programmatic picture of the Obama legacy. Instead, I will assess the impact of one key theme in Obama’s education legacy: redefining the meaning of reform for the Democratic party. Obama’s education presidency showed him to be unlike previous Democrats because of his willingness to support policies and programs that put him at odds, often publicly, with one of the most powerful and financially influential constituencies in the Democratic party: the National Education Association and the American Federation of Teachers, the country’s two largest teachers unions. According to data from the Center for Responsive Politics, the 3 million–member NEA (the largest union in America) spent more than $120 million on federal candidates and other political activities between 1990 and 2016. The 1.6 million–member AFT spent more than $80 million in this same time frame. To put this in context, the combined $200 million spent by the NEA and AFT on federal elections is more than AT&T, Goldman Sachs and JPMorgan Chase combined spent on these campaigns. In terms of raw politics, teacher unions remain one of the most vital forces in national Democratic and labor politics. Their grip is especially tight when it comes to education and presidential elections. For instance, the NEA endorsed Jimmy Carter in 1976, the first time the organization had endorsed any candidate for president since its founding in 1857. Without the endorsement it is unlikely that Carter could have won both the Democratic nomination and the presidency. The same is true for any candidate seeking the Democratic nomination (although every nominee that receives union endorsement does not win the presidency, as was the case in this past election). Even though Obama received an endorsement from NEA and AFT in 2008 and 2012 respectively, he was never a union darling like former Democratic nominees for president. Why? Neither union has been completely pleased with core elements of his education agenda, which they saw as too pro-teacher-accountability, pro-charter-school and pro-student-assessment. On teacher accountability, union opposition to Obama began before he delivered his first inauguration speech. In 2008, for example, when then-Sen. Obama mentioned merit pay during a satellite conversation with the NEA during its convention (some delegates even considered his nonattendance an affront), he was booed. Nor was his mention of charter schools received warmly. The AFT had similar concerns. In fact, the AFT endorsed Sen. Hillary Clinton for president in 2007, nearly a year before the national election, because her positions aligned with the goals of the AFT. 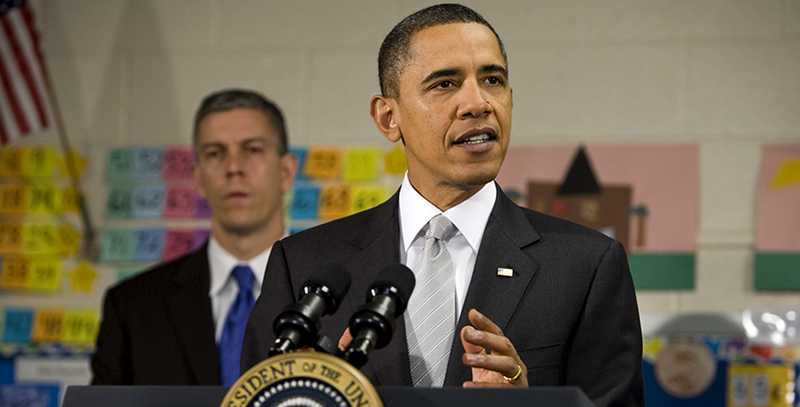 AFT President Randi Weingarten’s take on assessments differed substantially from Obama’s. “People are skeptical because the policies [he enacted] through Race to the Top actually worked as they were intended and they made schools into testing factories.” The contrast between her belief that Obama’s assessment protocol transformed schools into “testing factories” and his belief — that his assessment protocol would identify, assist and, when necessary, close (or prevent more) “dropout factories” — exemplifies a clash of visions for redefining the meaning of reform. Ultimately, Obama will be remembered among powerful education unions as the least popular Democratic nominee and president dating back to the endorsement of Carter in 1976. Still, his tussle with the unions over the meaning of reform within the Democratic party is one strong point of his education legacy. He was willing to take on a party power base because he believed it was in the best interest of families and children who simply want access to great public schools whether traditional or charter. Strategically, Obama advanced his education agenda by soliciting support from other power bases of the Democratic party: Silicon Valley thought leaders, Wall Street investors and nonprofit social entrepreneurs. Most important, educators — including teachers, principals, superintendents and school board members — played an important role in the Obama legacy, too. Many who believed accountability, transparency, standards and due process matter to the profession led a charge — at times against the wishes of labor bosses — to advance a meaningful reform agenda on a school-by-school basis without teacher-bashing. Obama’s education legacy and the lessons we learn from it will unfold with the passage of time. I expect the first glimpse of it will play out during the 2020 presidential election season. 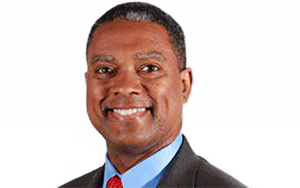 Gerard Robinson is a resident fellow at the American Enterprise Institute where he works on education policy issues including choice in public and private schools, implementation of K–12 standards, innovation in for-profit educational institutions, and the role of community colleges and Historically Black Colleges and Universities (HBCUs) in adult advancement.